We fountain pen people can be a particular people. (Which is different than being a peculiar people, but not always.) We tend to be very particular about the things we like, the way we like them, and how we believe they should be. 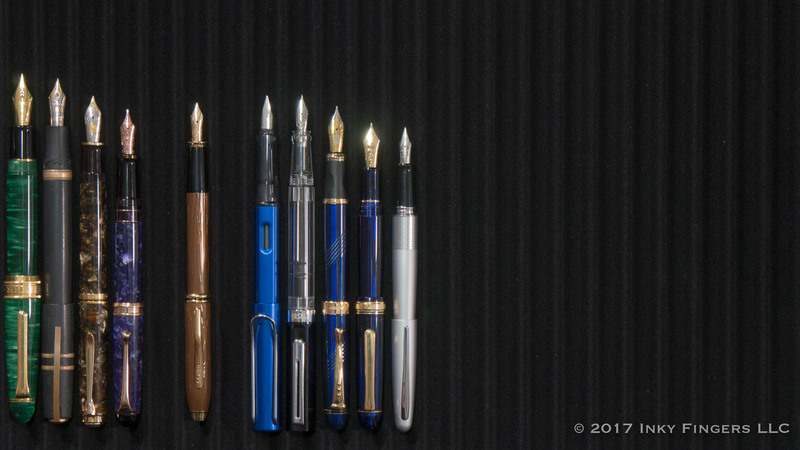 We get particular about our ink, our nib styles, our paper, our pen cases, etc. 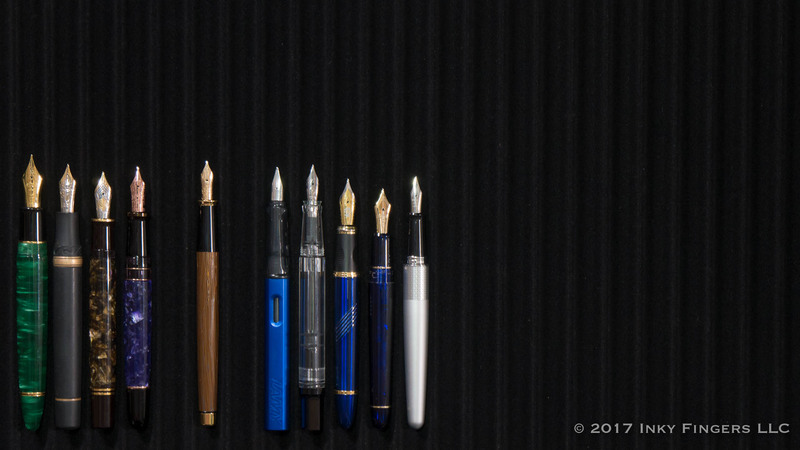 However, when it comes to particular-ness, fountain pen people have nothing on another group of…um…enthusiastic supporters. I speak, of course, of those wonderful fans of the film series, Star Wars. Star Wars fans are a passionate group, with just-as-passionately held beliefs about the fandom, the universe, the stories, the characters, the films, the directors, the scripts, the actors, etc. Serious Star Wars fans give any fandom in the history of ever a run for its money. My opinions of the film weren’t helped even one iota by the prequel trilogy that came out later. (The less said about those three films, the better.) And even the newer Star Wars films don’t do anything for me. I LOVE Sci-Fi and Fantasy films and novels. But Star Wars has just never been my bailiwick. It’s not my jam. I say all this, not to engender rage against my person (although I have a sneaking suspicion it will happen nonetheless) but as a preface to help you understand my approach to this review. I did not review this Cross Star Wars Townsend “Chewbacca” fountain pen as a Star Wars fan, since I’m clearly not a Star Wars fan. Instead, this pen is reviewed almost entirely from the point of view of a fan of fountain pens, and from that POV only. In 2017, fountain pen manufacturer Cross released three new models in a line of limited edition fountain pens based on the Star Wars universe. The first batch was released in 2016 and included top-billed characters like R2D2 and Darth Vader. 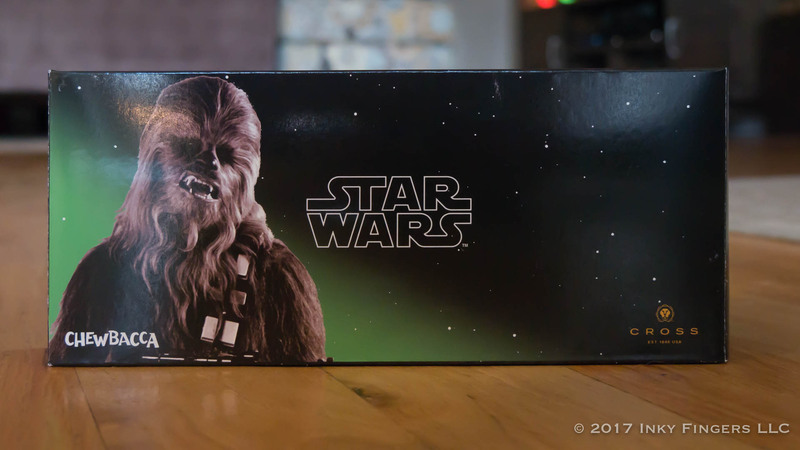 This year, the company went after Han Solo, Boba Fett, and the gurgle-growling Chewbacca. The pen comes in a cardboard box, featuring a space background and an image of the character in question. Inside the box are two smaller boxes. The smaller of the two contains an acrylic pen stand with the Cross logo on one side, the Star Wars logo on the other, and a channel cut across the top on which the pen rests. The larger inner box is the fairly standard pen coffin which holds the pen, a commemorative booklet, a couple of cartridges, and a converter. 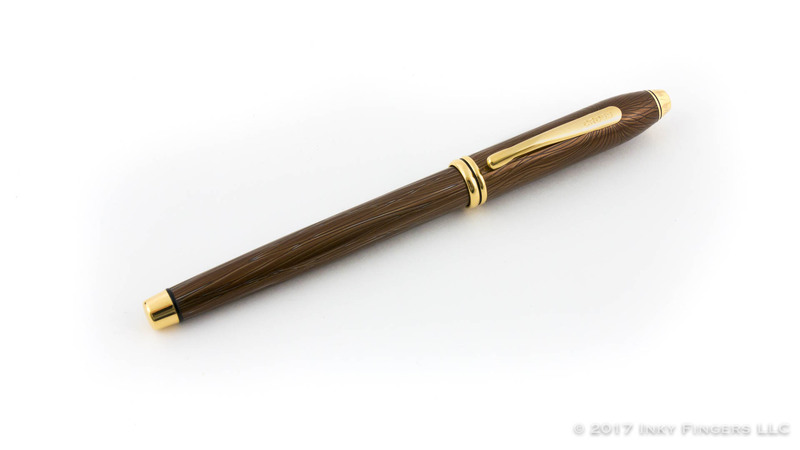 The pen itself is, under the surface, a bog standard-ish Cross Townsend. 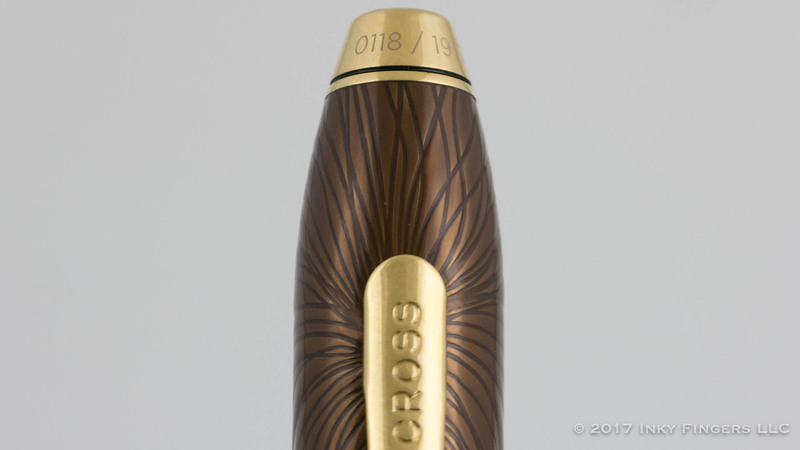 As one of Cross’s larger models, the Townsend tends to be a little thicker and longer than most of the pen’s in Cross’ lineup. 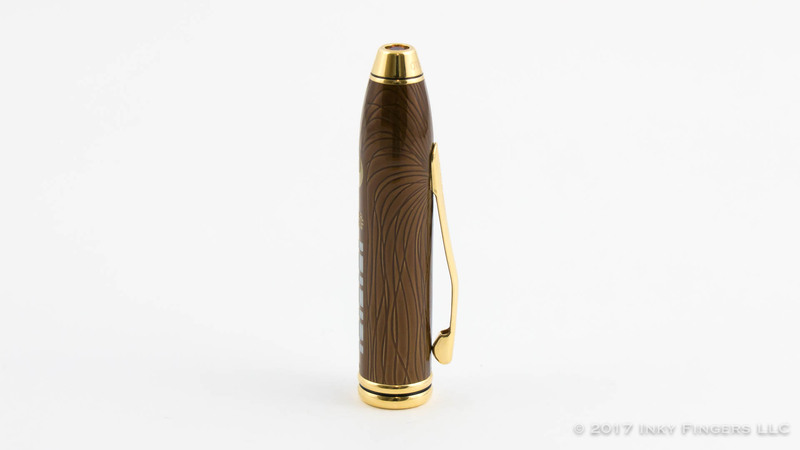 The pen is made of metal, and the Chewbacca model is stamped/etched with designs reminiscent of Chewbacca’s hair, which are highlighted by this rather luminous brown lacquer. 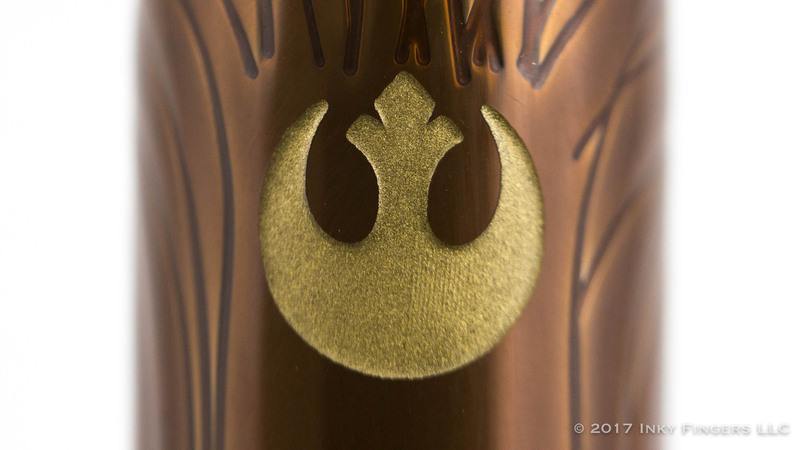 The back of the cap features some Star Wars design elements (my limited knowledge and complete lack of interest in the mythology of the Star Wars universe precludes me from having any desire to research what those markings actually are…you can see them in the picture below) laser etched into the surface and colored to contrast with the brown of the pen. 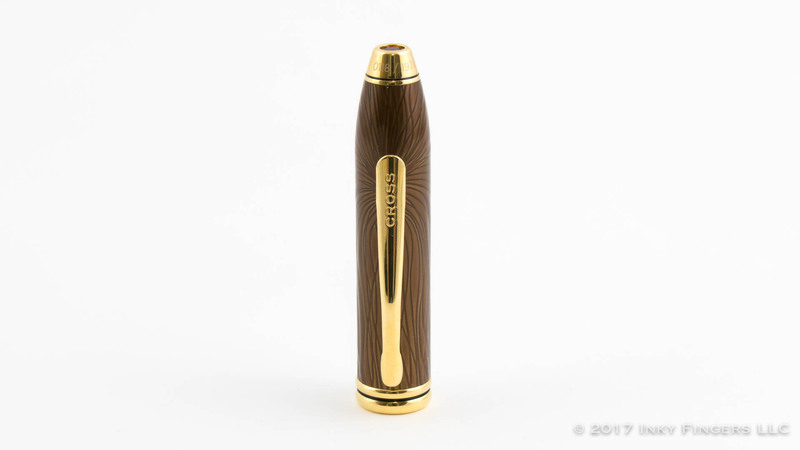 The pen’s hardware is gold-plated, and the top finial features a smoked quartz crystal inset into the finial. The pen’s limited edition number (out of 1977, the year of the first film’s release) is laser etched along the top finial as well. The cap is a slip-top version, which comes off with a bit of pressure, but remains securely on the pen nonetheless. 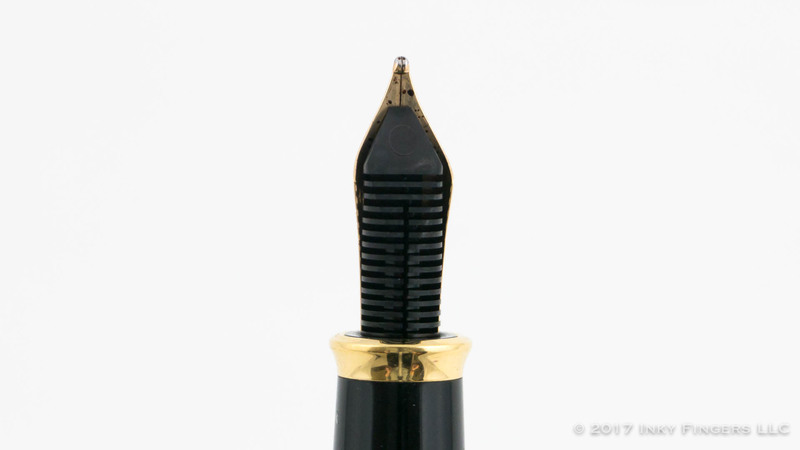 The cap is lined with a plastic inner liner which both keeps the nib wet and serves as protection when posting the cap on the back of the pen. 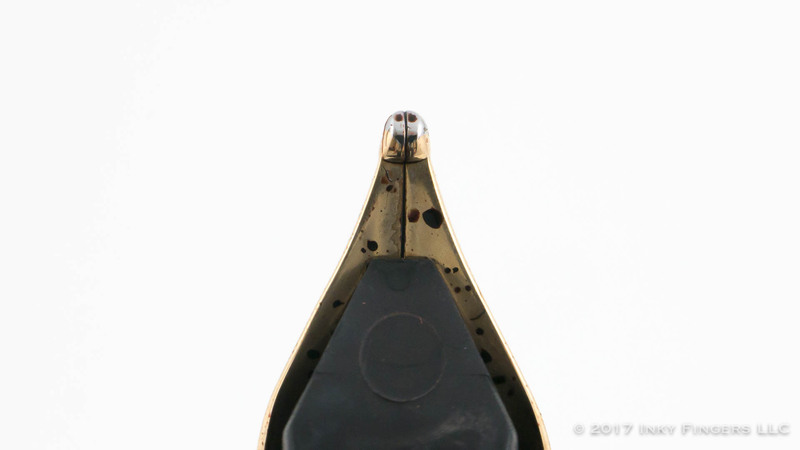 Under the cap is a black acrylic section which has an almost seamless join into the metal of the barrel. There is no step-down between barrel and section, which gives the user a decent variety of grips to pick from when writing with the pen. The pen is a cartridge converter pen and utilizes Cross’s proprietary cartridge/converter system. While I am not a fan of proprietary converters, Cross’s converters have never given me any issues—aside from the fact that they’re relatively difficult to find and limited to a brand that doesn’t seem to have a lot of top-of-mind presence in the current fountain pen community. The pen and the section tenon are both metal, so this pen is not suitable for eyedropper conversion. Up to this point, I really have no issue with the pen. It’s not my cup of tea, but it’s well-made. It’s a well-considered design that manages to depict the character while still abstracting the design enough that it doesn’t feel overly cartoony or blatant. 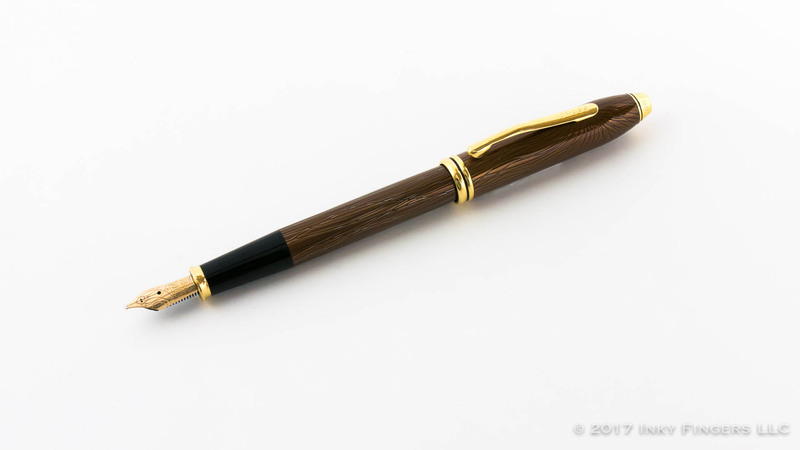 The pen is relatively comfortable to hold, not too heavy, and well-balanced even when posted. There is a lot to like in the pen’s design and construction. Then we get to the nib. 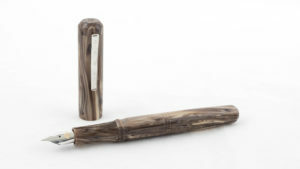 This pen is one of Cross’s higher-end offerings, and as such, comes with a small (approximately #5-sized) 18k gold nib. The nib has some nice designs and the Cross name stamped into it. 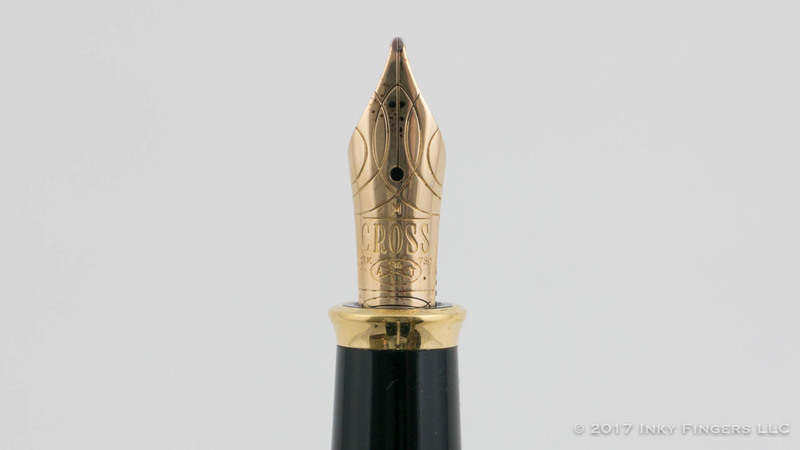 I have used one of Cross’s 18k gold nibs in the past, and was quite pleased with its performance. Unfortunately, I didn’t have the same experience this time around. The medium Cross nib was just…okay. The nib was smooth, but it had pretty clearly been over-polished, resulting in some moderate hard-starting issues, especially with drier inks. The pen is a wet writer, but the feed seemed to exhibit minor (and it really was minor) ink starvation with longer writing sessions. The medium nib was medium, but it was certainly on the broad side of that designation. It was a mostly pedestrian writing experience, with small moments of frustration thrown in here or there. There’s nothing about the writing experience that couldn’t be fixed with some adjustment, but nothing about it that I found particularly out of the ordinary either. In the end, the Cross Townsend Chewbacca is a nice pen with a decent writing experience. 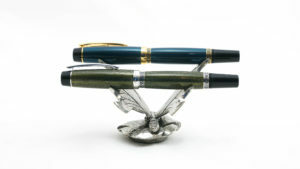 It is also a pen with a $575 price point. Now, in the past, I’ve had a hard time answering the “is it worth it” question when it comes to expensive pens. What is “worth it” for me and for you may be very different. 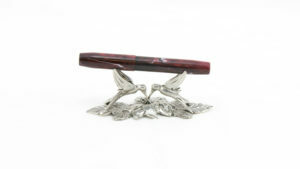 For me, $575 is too much for this pen. As someone without an emotional tie to Star Wars, this pen’s writing performance or design don’t justify that price point. Someone for whom Star Wars was a cultural or developmental touchstone in his or her life might find this price entirely reasonable. In the end, these are nice pens…they’re just not the pen for me. Even with the writing annoyances I experiences, I would consider buying the pen if the design were something that had meaning to me. 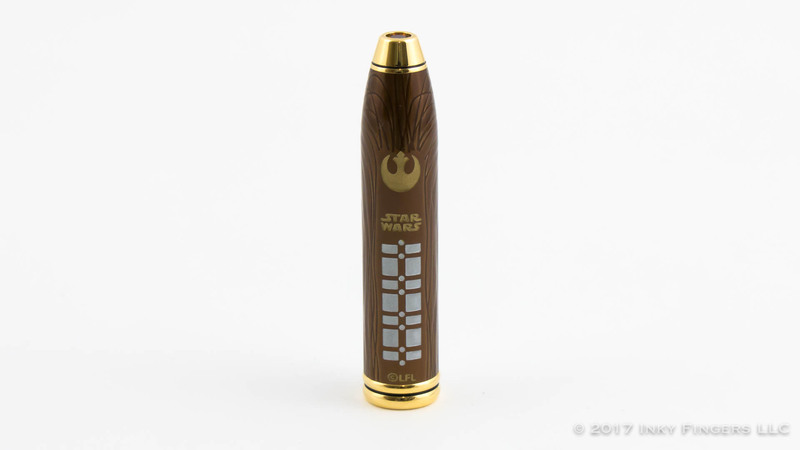 This is, in my opinion, not a pen for a serious fountain pen user, it’s a pen for a serious Star War fan who also happens to use and like fountain pens. 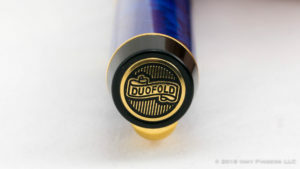 This pen was loaned to The Pen Habit by Goldspot Pens in exchange for an honest review, and will be returned following this review. 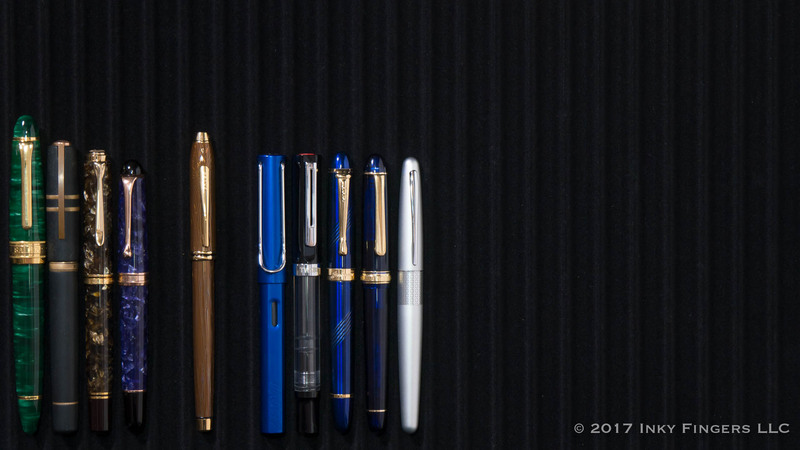 Goldspot pens is a current Pen Habit sponsor, but all opinions expressed herein are mine alone.